Located just minutes south of Nashville, we are close to everything, yet away from it all on 76 private gated acres of gorgeous reclaimed limestone quarry. We’re out in the country, yet just off the intersection of highways 65 and 840. 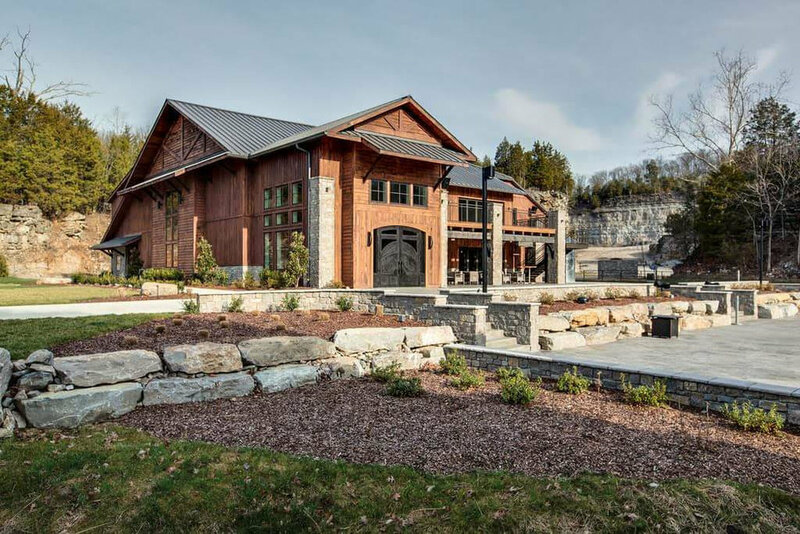 Our two event buildings are rustically elegant and pure Tennessee, with lots of our own quarry stone, wood milled right here in Franklin, and vintage furnishings. The Gathering Hall is a magnificent 2 level event space with soaring 30-foot wood ceilings, beams, and central air and heat. One end features a towering two story stone fireplace. The other end has a removable stage area and 3 large projection areas with state of the art event lighting, video and sound already built in. The slide-away glass doors open out onto covered porches and a large outdoor patio that fronts our dramatic quarry pond and waterfall, Moonshine Cove and Falls. The patio can be set for lunch, break out groups, live music or free time. This building has a full catering prep kitchen, restrooms on both levels, free WiFi, cell phone/computer charging stations, a speaker’s green room, and an elevator for ADA access between floors. 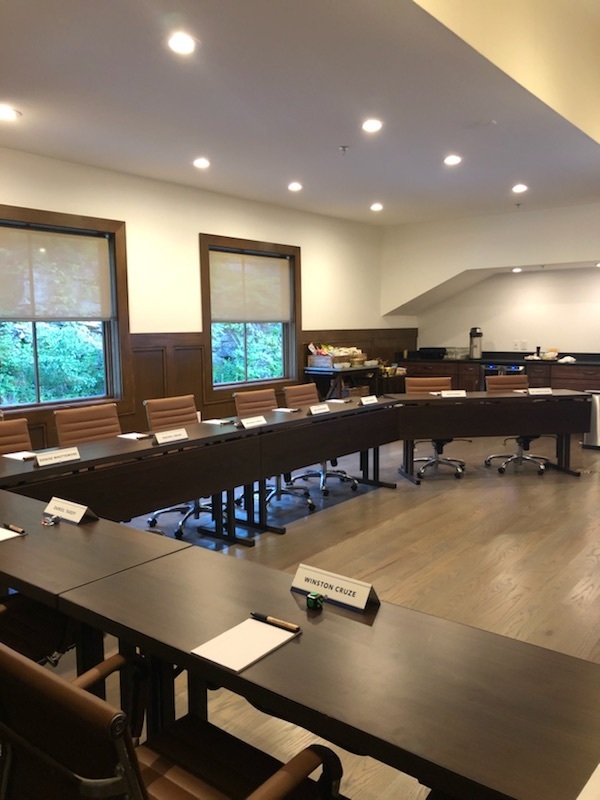 Located on the upper level of the Gathering Hall, the Board Room provides a private and comfortable location for meetings of up to 25. This space has state of the art presentation equipment, free Wifi, whiteboards, and can be arranged in whatever way is most conducive to your meeting needs. Using the fiber optic internet connections you can even conference in remote participants. This space is rented hourly with a 2 hour minimum Monday through Thursday. Please check for last minute Friday through Sunday availability. 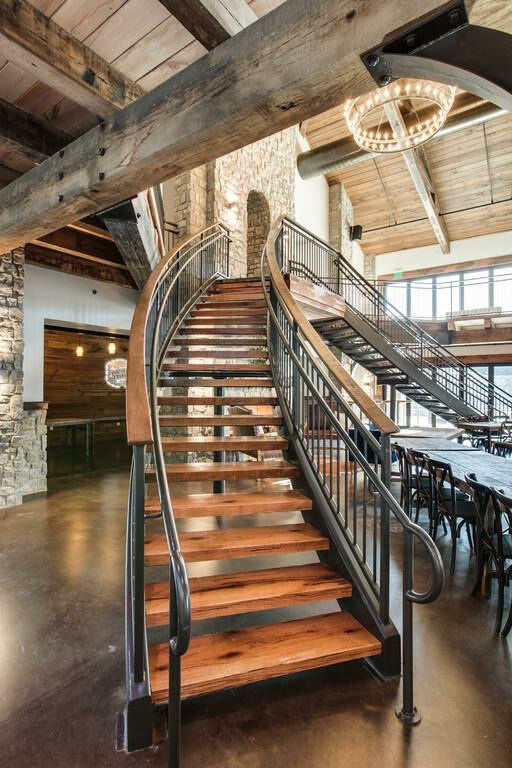 The Hillside Pavilion is bright and open event space with free WiFi, central air and heat, three sides of slide-away glass that open out onto covered porches, 3,000 square foot patio and beautiful view of the meadows, forests and hills. Available as an added space, the Pavilion is great for a smaller meeting or set up with 15 trade show booths. This building has restrooms and a speaker’s green room which you can see here set up for a small meeting. The soaring ceiling, skylights and indoor/outdoor capabilities of the Pavilion make an ideal spot for your business meeting needs.